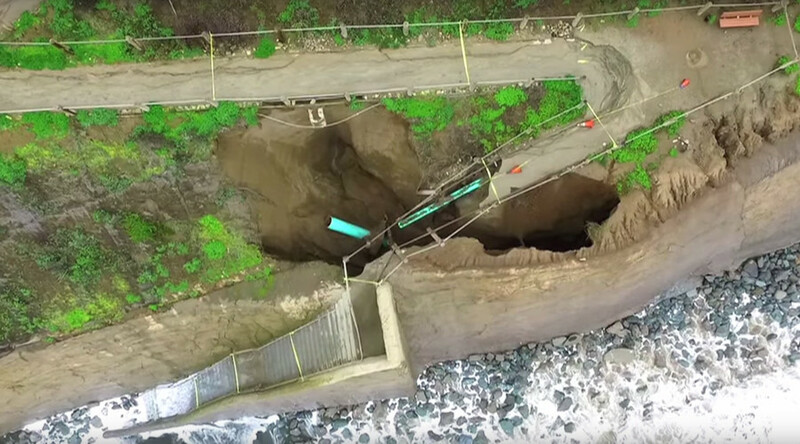 Devastating sinkhole damage caused by severe coastal erosion at Pacifica, California has been captured in stunning drone footage. The shoreline at Pacifica is constantly being battered by giant waves and erosion poses a severe threat to the buildings dotted along the cliff edge. The new sinkhole, which emerged last Saturday, destroyed a large chunk of pathway and closed access to a popular beach. It’s believed to have been caused by some of the biggest waves of the year, known as the King Tides. High tides and stormy weather have also slowed attempts to repair the damage. The stretch of coast is constantly crumbling away, ground down by the elements. Another video, shot in January, shows the shocking impact erosion has had on the area. Entire buildings teeter at the edge of the cliff as large chunks of earth drop off into the sea. Pacifica City Manager Lorie Tinfow said during the week that an apartment complex that sits on the edge of a cliff in the area will be demolished as it poses “a clear danger.” The property was evacuated in January after El Nino-related storm erosion. In a statement at the time, Tinfow said that “worsening conditions on the bluffs posed an imminent risk to residents and left the structure unsafe”. In March, a neighboring apartment building was also demolished after it was declared hazardous.